I would like to write some useful articles for those who want to step into the digital world of model railroading. It's not my intention to create the ultimate guide to digital systems, nor to cover all technical aspects and all kind of details. There are millions of much better pages out there and really specialized in concrete buses, wiring, lighting and each one of the different aspects of the digital railroad modelling world. My intention is just to create an introduction to that, and easy way to step into with no fears, so people used to analog layouts or completely novices feel safer and more confident to move to DCC world. Analog layouts and systems are quite old, with many years of experience, and nowadays there is no one inventing new things: one transformer for each aisle circuit, one train can move in each of these circuits, push buttons to change switches, electrical switches to light traffic lights and activate or deactivate current in a section... and some automation more or less complex (but simple) using relays, diodes or passive components. That would be the most common scenario for analog layouts. More or less all problems or doubts have one good answer or way to solve them, and the number of elements and ways to solve it are really reduced in comparison to a digital system. Like said before, in analog you use simple electronic components like diodes, relays, switches, resistors, .... not much variety (taking as an example a simple or common layout). And you can mix easily components or products from distinct vendors. Digital world is not more complex (I think it's easier). A good example for me would be in telephony: modern smartphones aren't more complex to use than and old and analog one, if you use it just as a telephone!!! But as it has a lot more of functionality, options, vendors, operative systems, firmwares, connectivity, .... seems more difficult. Same thing happens in digital railroading, and besides that it's still an immature market with no big standards set (just DCC as you will see or the ones from Digitrax manufacturer). There are lots of vendors, new brands every day, every one makes it's own systems not compatible with others trying to be the first setting a big standard, ... It's normal for someone starting to have so many doubts!! And to start in a proper way, I think the better is a bit of history to know where one of the big standards called DCC come from. 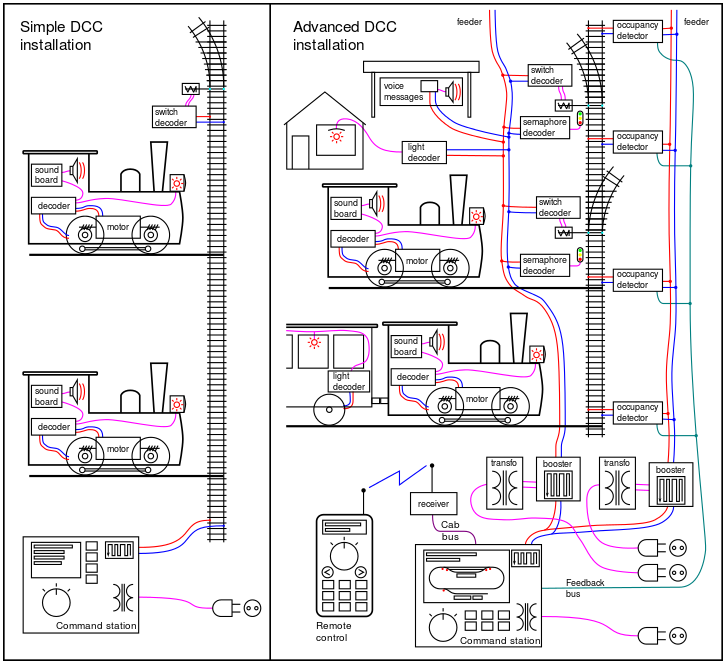 If you read something about digital systems in railway modelling, for sure these three letters appeared everywhere: DCC (Digital Control System). Many times it's used in wrong way to talk in a general way about any digital train control system. But strictly speaking, it's the NMRA DCC; a communication protocol defined by NMRA (National Model Railroad Association) in 1993 which defines the communication system to send orders to the locomotives at both physical and electrical level. It defines a central station that, in conjunction with a booster, modulates the track current to encode digital messages at the same time that delivers current to the rolling stock. Inside locomotives a small chip (called Decoder) is installed in order to decode and understand those messages and act to the orders. So, here we have a bit difference in front of analog systems: digital tracks are always feeded with current, it doesn't matter if locomotives are moving or not. That also means more that one locomotive can be in the same section and it's not needed to create aisle sections for each locomotive. Because the orders to start, break or turn on the lights are sent personalized for each locomotive. Later on the different components of a digital system (central station, booster, decoder,...) will be better explained. There are other protocols or digital systems to command trains like Selectrix (created by Döhler & Haas, bidirectional and based in a big industrial standard from Siemens) or Motorola, but now a days DCC is the leader of the whole market despite is the worst protocol ever thought. Yes, you read well. The ones who designed this protocol hadn't a wide view nor future vision, and created this protocol completely unidirectional, just from the central station to the locomotives. So you can send commands to the trains, but trains cannot answer any kind of information. Knowing this fact, you will easily understand later why you need a programming track to setup the decoders where locomotives have to move the motor to send acknowledge signals to the central station, or why you can configure a locomotive in the normal track but you cannot read the current configuration values. So, with this protocol or system we were able to move locomotives, but we also wanted to command switches and lights. That's why a new kind of decoders appeared, called "static decoders" in front of "mobile decoders" (the ones installed inside the trains). Static decoders are connected to the rails' current and receive DCC commands to turn on/off switches, lights or any other device. But not after a long period of time, the need of receiving information appeared. In order to automate the control of the layout from a computer software it was needed to know the occupancy of each section of the layout using any kind of sensor (consume sensors, reed contacts, light barriers....). Here in Spain Railcom didn't become popular, but its competitor S88 from Märklin (a really similar systems for feedback modules) is still in use and widely used. The "boxes" connected to the physical sensors and sending the occupancy signals are called "feedback modules". So a common digital installation (I said common, not modern) is composed by the Central Station and booster, of course a throttle to set the speed and direction of locos, mobile decoders installed inside locomotives, stationary decoders to command switches and lights, and feedback modules to send occupancy detection signals to the main system (usually a PC). Just to finish this brief review, DCC has an extra problem: as static decoders (those controlling switches, lights and outputs generally speaking) are connected to the track current, consumption can grow easily to be forced to buy another booster, which is an expensive element. To solve that, and relatively new in this world, appeared the Control Buses. Static decoders and feedback modules as they are known until this time disappear, and everything (called just input or output modules) are connected together to a single communication line (bus) that shares completely all messages and information of all elements of a layout. In next posts I will talk about Control Buses and a modern digital system approach using them as I understand this digital world.